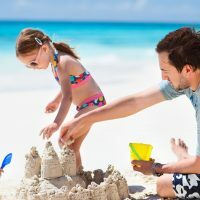 You’ve finally admitted you don’t want to pack a million shoes for your family vacation, only to actually wear one, maybe two of them. Congrats, you’re making a step in the right direction. We’re here to help you find just one pair of summer sandals that are stylish, versatile and most importantly, comfortable. These are the best sandals for summer vacations — guaranteed to lighten your load and make you feel good, too. These aren’t your grandfather’s Crocs! Believe it or not, the Crocs Women’s Sexi Flip Flops are stylish, sleek, versatile and feature the same comfort that Crocs are known to offer. Featured in black, espresso or candy pink, the slim sandal has a one-piece thong that runs up the top of the foot and around the ankle. They can easily be worn during the day while you’re chasing the kids around and then with a sundress for dinner in the evening. The massaging nub footbed and arch support, featured in all Crocs products, keeps feet comfortable throughout the day. The KEEN’s brand is known for its hiking shoe and comfort is the top priority. 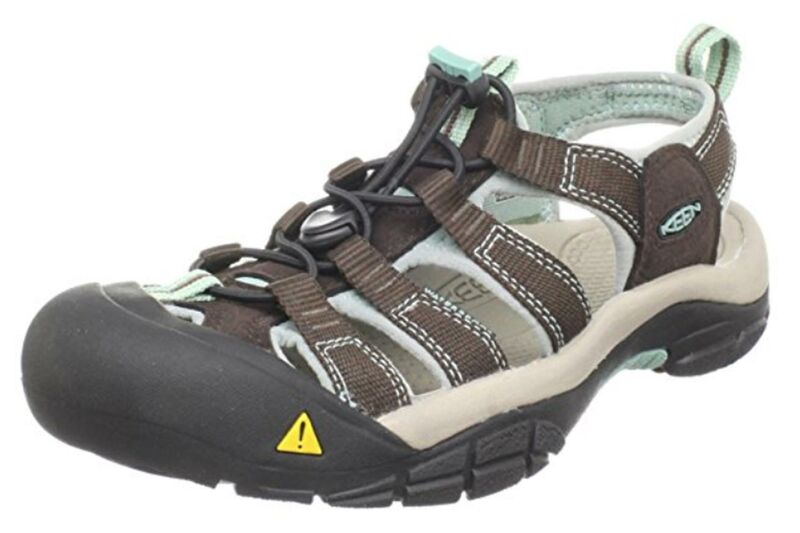 The KEEN Women’s Newport H2 Sandal is ideal for summer travel that may involve some adventure as well. They can be worn in the water and on land and the closed-toe keeps piggies safe from rocks or pebbles. They feature excellent arch support and are easy to clean if your day turns muddy or messy. If your summer travel includes waterfalls, hiking, zip lining, cave exploring, camping, water parks or tons of walking – KEENS are your answer for comfort. They are on the pricier side, but well worth the investment. You know how your feet feel when you practice yoga? Well these sandals have you walking on a yoga mat all day long! The foot bed is made from real yoga mat material, making it an excellent cushion for the foot. The cotton fabric that wraps around the ankle is super comfortable and limits the possibility of blusters, as well. 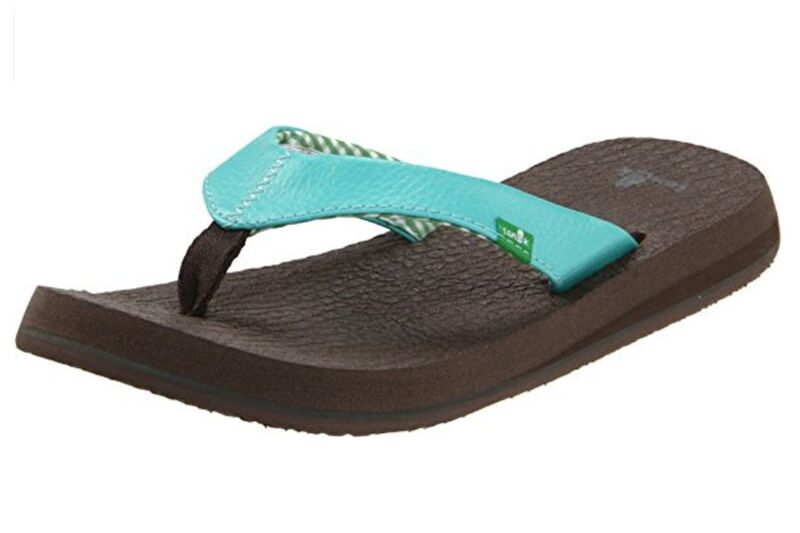 The Sanuk Women’s Yoga Sling 2 Flip Flop comes in various colors and prints and can easily be a casual day flip flop or fancy night out sandal. The Sanuk brand also offers a traditional flip flop! 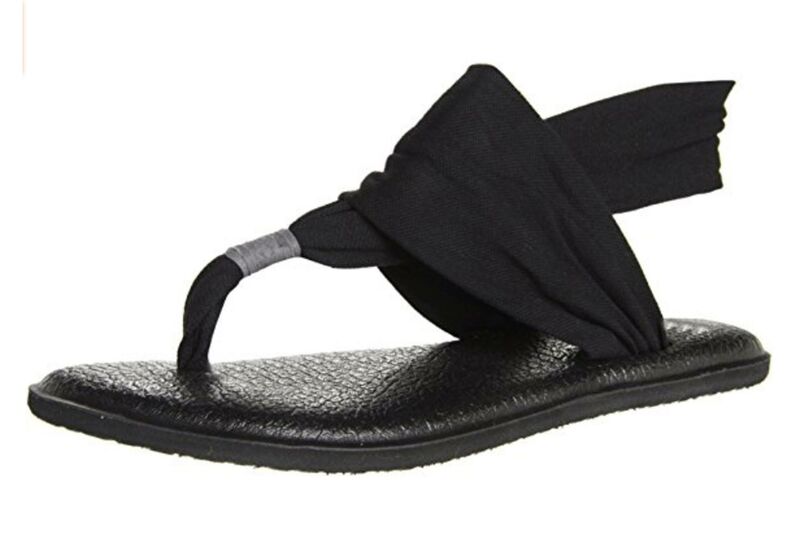 The black yoga mat footbed keeps your feet cushioned and comfortable and the thong strap comes in a wide variety of solid colors on the exterior, and then the interior features a cute pattern. The Sanuk Women’s Yoga Mat Flip Flops are perfect for the beach or pool, but can also add a cute splash of color for a casual dinner out. 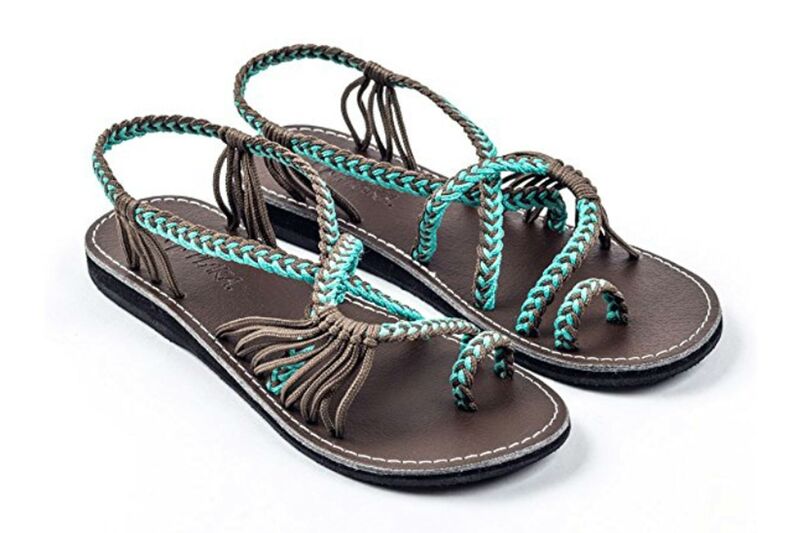 These handwoven braided rope, strappy sandals come in a variety of colors, and the straps are somewhat adjustable so the potential for blisters is limited. The Plaka Flat Summer Sandals are lightweight and flat (not much arch support) and they take up little space in a suitcase. These comfortable summer sandals are also water resistant so you won’t ruin them at the beach or pool. This summer sandal is all about the footbed. The rubber outer sole is covered in cork on the interior, making it cool and smooth for your foot, and it also features a supportive arch. There are two wide leather straps across the top of the foot and a buckle strap around the heel, but you can slip them on and off easily without bothering with the buckle. For a long day of walking and exploring a new city, the Merrell Women’s Around Town Backstrap Sandals are perfect. When a sneaker brand also makes sandals, you know those sandals will be comfortable! 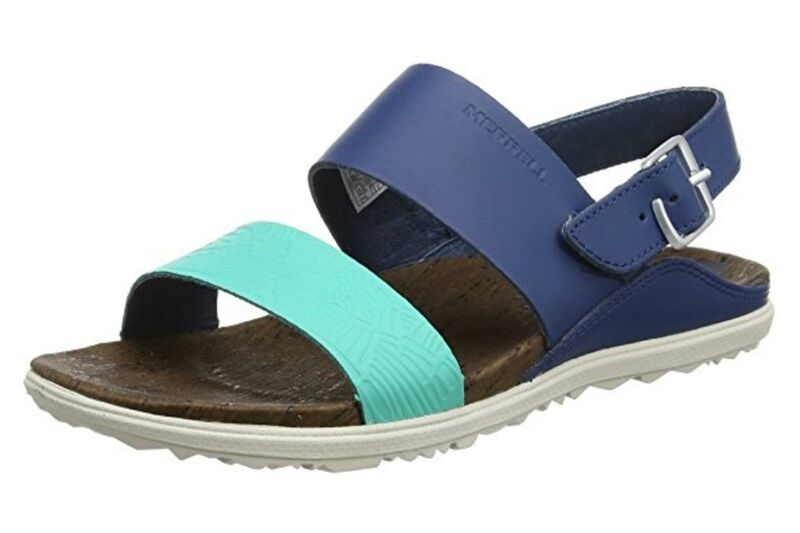 Skechers Women’s Reggae Mistry Morning Sandal is perfect for summer travels spent hiking or biking. The Velcro straps are adjustable so you can get an ideal fit for your foot and the contoured foot bed has plenty of arch cushioning. These lightweight sandals are open toe and have a thick rubber sole, making it easy to explore or chase children at the water park while wearing them! Cute, comfortable and cheap – need we say more?! These summer sandals for travel have sort of morphed all good things into one shoe. 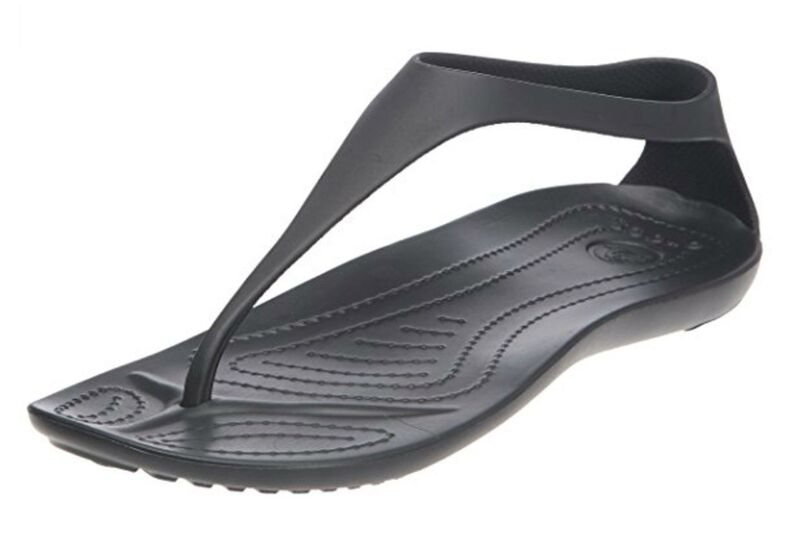 They look like a flip flop, but the braided thong strap and buckle makes them more like a casual sandal. The platform bottom gives ladies a little height, but it’s a rubber cushioned, shock-absorbing sole so the comfortable factor is still intact. 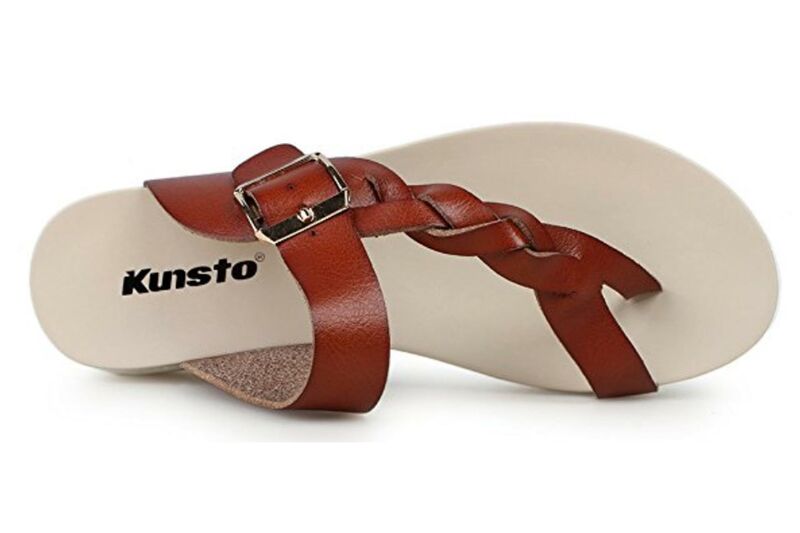 Wear these summer sandals with pants, shorts, a bathing suit or a dress – the Kunsto Women’s Platform Braid Flip Flop Woven Thong Sandals are definitely multipurpose. 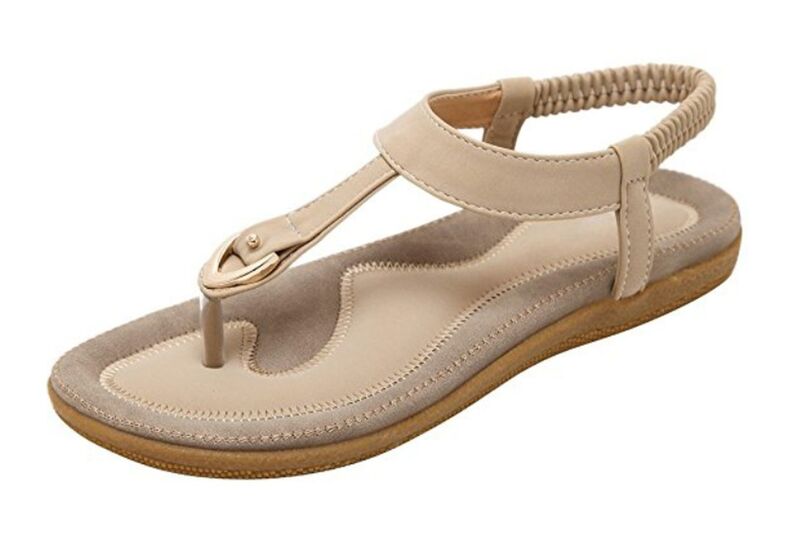 These lightweight, cork sole sandals feature good arch support. The thong strap extends over the top of the foot and around the heel with a decorative button and comes in black, taupe, teal and magenta. The Ahnu Women’s W Serena Cork Sandals are especially great for swollen pregnant feet, and are easy to slip on and off. The comfort level can easily carry your feet from day to night in these summer travel sandals. Featured in beige, pale pink and navy blue, the Dear Time Slingback T-Strap Flip Flop Sandals will have your feet walking on a cushiony cloud. 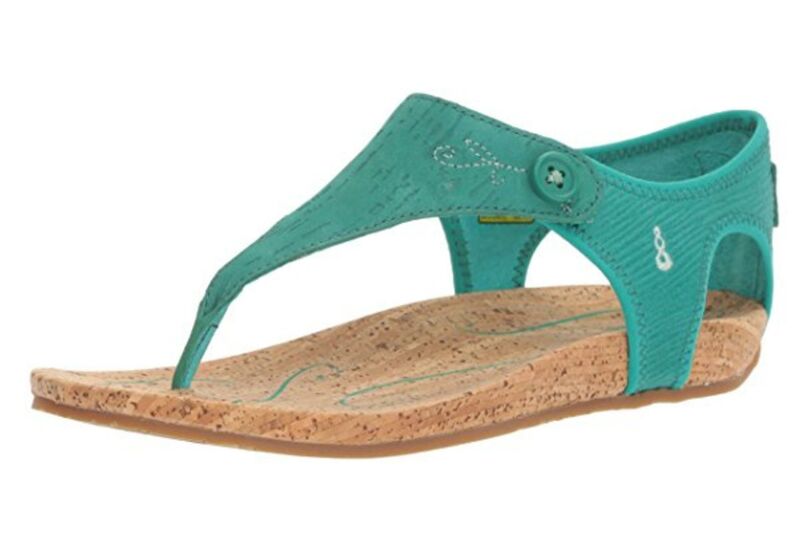 The soles of the flat sandals are extra thick and soft so your feet will be comfortable all day. The straps are faux leather and the piece around the heel is elastic so blisters will be limited. The sizes do run smaller than average American sizes, so keep that in mind when purchasing.